Would You Bike 20 Miles for a Cookie? Some hop on a plane and see the world. Others travel vicariously through books to the places they dream about. I do a little of both. You might have noticed that already. This past week I hopped on a bike with the Vogel family and hit the road. Ok, not really. I don’t even own a bike. I did get a sneak peek of their new, self-published book “20 Miles Per Cookie: 9000 Miles of Kid-Powered Adventures,” which is officially out today. You might have already heard of this little family of four. 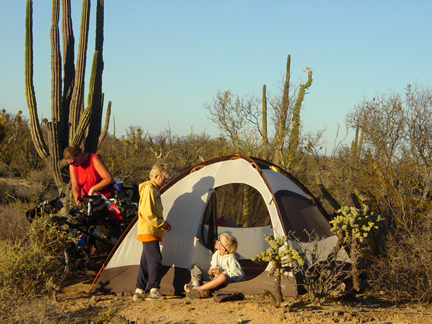 They recently created a buzz while biking the Pan-American Highway from Alaska down to Argentina. Their twin boys were the youngest to ever make the journey. Yet this was not the first time they had hit the road. A few years before, the whole family took on a large chunk of the U.S. and Mexico, which is where “Twenty Miles Per Cookie” begins. 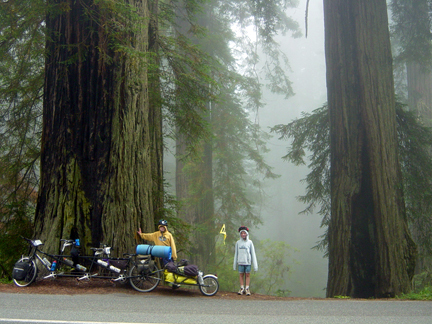 The boys were only 8 years old when they mounted their bikes to start a yearlong adventure. Mom and dad had a spirit for checking out the unknown that could not be squelched. They also couldn’t seem to settle into the “American Dream” of comfy suburban life. Who can blame them. My armchair adventure with the Vogel family did not give me a never before seen peek at historical sights around the U.S or through the cultural intricacies of the indigenous people of Mexico. It wasn’t that kind of journey. Sure I got a taste for what they saw along the way and the native people that they met, but this book delved deeper than that. After all, if you wanted to simply experience a new place, you could hop on a plane. This book brought me through 9000 miles on a bicycle, a mode of transportation many people would not choose to take. I rejoiced in their triumphs as John, the patriarch of the family, gave his legs one more push so he could get himself, his 2 boys and their gear up another steep climb (they were on a 3 person bike). I cringed as Nancy, the matriarch and author, got yet another flat tire in some of the most miserable weather you could imagine. I giggled along with the boys when they made up a new game with bottles found along the road. 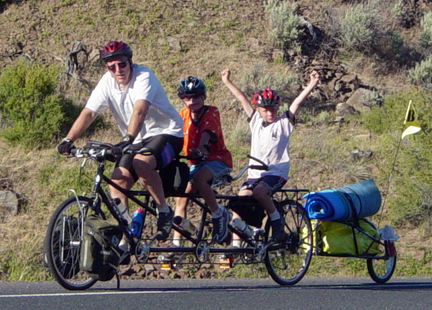 The family pedaled through extreme cold and blazing hot temperatures. They pushed themselves through situations that would have had me back on a plane in no time. And yet, they didn’t give up. Even as devastating news was being relayed from the family back home in Boise this little band of bikers figured out how to pushed on and continue to their end goal. One prominent theme in this book is the “Road Angels” the family comes across. In a time when we are all adding a second deadbolt to our door, telling our kids to trust no one and monitoring every second of their lives on the web, the Vogel family learned to have a little trust in their fellow man. As darkness fell and they had nowhere to pitch their tent, a driver would come along and invite them to camp out in their front yard. When they were biking uphill through an unbearably hot day an “angel” would find them and give them food and water to keep up their strength. I did find myself getting a bit lost along the way however. There is a map in the front of the book. I was reading an eBook version so it was hard to flip back and forth to the map to see where we were. I wish there had been a timeline as well to let me know how far into the journey the Vogel’s had gone when they reached Mexico and other major milestones. Anytime I did find myself wondering where I was a favorite bit of the book would pop up; the boys letters home to grandma. The boys would send their perceptions of what they had seen and learned so far on the trip. Some were hilarious and some just made me cringe as they made light of a situation, like rattle snakes, which left my own heart pounding. Most of the book is from Nancy’s point of view, so these added tidbits really lent some depth and added perspective to the journey. Photographs accompany the chapters to show you various stops along the way, but also how much the boys grow and change. You also get a very clear visual of the obstacles they faced. Sure there were arguments and beaten down spirits. Even families on the road have their disagreements and squabbles. There are also smiles, laughter and incredible memories that this family will be holding onto for years to come. I don’t know how the Vogel’s do it, but they sure found a magic combination for family time and travel that works for them. 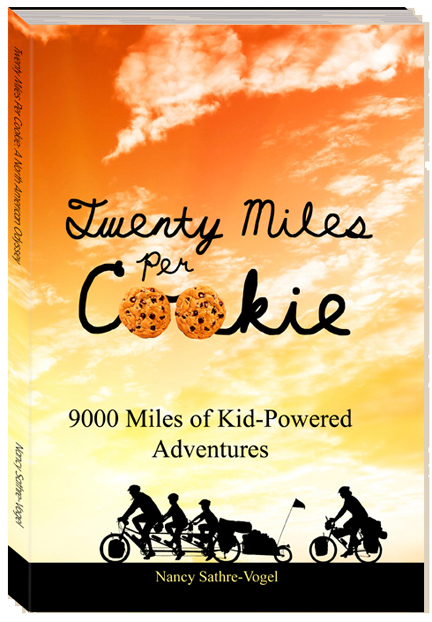 You can get your own copy of “Twenty Miles Per Coookie” via the Family on Bike’s website. You can also read blog entries from this journey along with other trips they have taken. And yes, they are on their bikes for most of them. Stay tuned for their next book, which I have a feeling will tackle that Pan-American Highway trip. I can’t wait to see what adventures they drag me into next…via my couch of course. For more info on the book or to order your own copy, head on over to Family on Bikes. Full Disclosure: I was given a copy of this book by Nancy Vogel to review. However, my opinions are my own. I was in no way influenced or monetarily compensated for any portion of this post. You know me, I just enjoy telling you all about what I read. On a personal note, I will add that I met Nancy Vogel in person last June at a blogger conference. I swear within 10 minutes she had me convinced I should buy a bike, throw Dek on the back and tell Mike we were off to see the world. She has a charismatic spirit that is catching and comes through in her books. Her love for her boys leaps off the page and her passion for family travel and educating through seeing the world is very evident on the Family on Bikes website. If you can see her speak in person I encourage you to make the effort. If not, read through her blog. It’s not every day you meet someone who is crazy enough to get on a bike and just head south. I mean way south, like you can’t go any farther without hitting Antarctica. But don’t put that idea in their heads. They may just figure out how to bike through a whole lot of snow and penguins! Image Note: All images are the property of the Vogel Family/ Family on Bikes. Usage was granted to Walkingon Travels for this post. For future rights, please contact Family on Bikes directly.